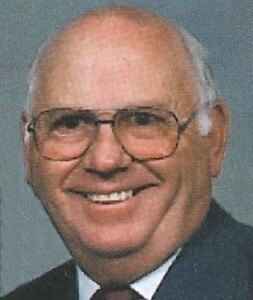 Raymond Lee "Junie" Banet, Jr.
Raymond Lee “Junie” Banet, Jr., 88, of Floyds Knobs, Indiana passed away on Sunday, February 10, 2019. He worked at Hoosier Panel and E.M. Cummings. Junie was a life-long member of St. Mary of the Knobs Catholic Church. He was born on July 8, 1930 in Floyds Knobs to the late Raymond and Flora (Sprigler) Banet. Junie was also preceded in death by his sons, Kevin Banet, Richard Banet; and brothers, Elston and Jerry Banet. He is survived by his wife of 68 years, Evelyn (Schmidt) Banet; daughter, Linda Schmidt (Jim); daughter-in-law, Dottie Seacat (Michael); siblings, Loretta Atkins, Venita Lynch (Jim), Frank (Frances), Edmund, and David Banet (Ann); sister-in-law, Joan Banet; and many grandchildren, great-grandchildren, nieces and nephews. Visitation will be from 3 PM to 8 PM Wednesday, February 13, 2019 at Newcomer Cremations, Funerals & Receptions (3309 Ballard Lane, New Albany). His Funeral Mass will be celebrated at 10 AM on Thursday in the chapel at St. Mary of the Knobs Catholic Church (5719 St. Mary’s Road, Floyds Knobs) with burial to follow in the church cemetery. Memorial contributions may be made to his church. Please consider sharing a memory of Junie or leaving a special message for his family using the "Share Memories" section below. Add your memories to the guest book of Raymond Banet, Jr.. I will always remember gardening with my Grandpa and Uncle Junie. Anytime he would see me and Grandpa gardening he would always come down and lend a hand. On Halloween I would always stop by Uncle Junie and Aunt Evelyn’s house first, and Uncle Junie would always tell me not to take the good candy. He was always really fun to be around and I will surely miss him. The last time I saw him was a few years ago when he came down to our house and thanked me and Dad for picking up some sticks out of his garden and he gave me $5, no one had ever paid me for doing something before, and Uncle Junie was the first person to do that. Love you Uncle Junie, Rest In Peace. Uncle Junie was great.i got my nickname from him... he would always call me “Ginny Too”! He said I was always saying “me too, me too” when I was young. Love him very much. We are saddened by his death but glad heaven has him! Just want to express my sincere sympathies to your family. Thinking of you at this difficult time.